Wondering where to head for a beer or cocktail after work? So were we! So...we went exploring and rounded up a few of the best happy hour spots in Albany. Whether you want a low-key place to unwind or a pick-me-up after a long day, Albany's best happy hours have you covered. The deals are always changing, but these hot spots will never disappoint. Capital City Gastropub - With everything from poutine to pickled onion rings on their appetizer menu, the Capital City Gastropub is one of the best spots in Albany to get bites with your beer. The menu changes seasonally, but there's always something for everyone, including vegetarians! The Hollow Bar + Kitchen - Happy hour at The Hollow is pub fare at its best. Sliders, skewers, and even grilled veggie platters make the cut at this restaurant and live music venue. LAX on Lark - If you're in the mood for a little something different with your happy hour cocktail, head over to LAX on Lark for some of the best spring rolls and coconut shrimp in the Capital Region! Albany Pump Station - Featuring brews from C.H. Evans Brewing Company, the beers at Albany Pump Station are handmade and always on rotation. Albany Pump Station is the place to be after work if you love craft beer and you want to try something new. 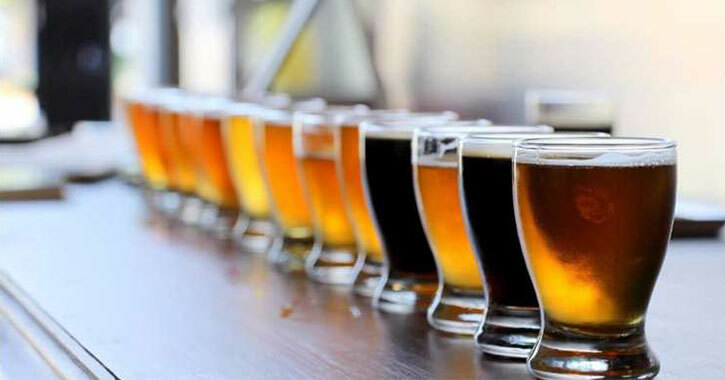 City Beer Hall - With up to 20 different beers on tap from large and small brewers, City Beer Hall is perfect for happy hour with friends and colleagues who all have different tastes. Food includes everything from snacks to small and large plates. Wolff's Biergarten - Wolff's has locations in Albany, Schenectady, Troy, and Syracuse (this one is probably a little far for happy hour, though). With the best selection of German beers in the Capital Region, Wolff's doesn't serve beer, they serve bier. Voted the 2nd best soccer bar in the nation, Wolff's has a fun, laid-back atmosphere and really good pretzels. Bombers Burrito Bar - For margs, obviously. Bombers could have made the list for best bites (their guac is pretty good), but we decided they're more notable for their confetti salt-rimmed margaritas. Restaurant Navona - You can't go wrong with the cocktail list at Restaurant Navona on New Scotland Avenue in Albany! You'll also love the relaxed and welcoming environment the restaurant has to offer. Wellington's - Located in the Renaissance Albany Hotel, Wellington's is probably Albany's classiest happy hour. With signature cocktails and an inviting but modern interior, Wellington's is a must for anyone who prefers their happy hour on the rocks. Provence Restaurant - Provence Restaurant has a happy hour Monday through Friday from 3pm to 7pm with $5 wines by the glass, but that's not all! They also offer 25% off all bottles of wine Sundays and Mondays. Angelo's 677 Prime - Head over to Angelo's 677 Prime in Albany from Monday through Friday, 5pm to 7pm, for happy hour at the bar! The restaurant offers great discounts on select martinis, well drinks, wines, and appetizers. Umana Restaurant and Wine Bar - Umana brings together flavors - and people! - from around the world. Enjoy discovering new foods and unexpected pairings at the Washington Ave restaurant. Do you have other favorite spots in and around Albany for unwinding after work? Let us know what area bars and restaurants you think offer the best happy hours in Albany in the comments!